are close-range pain compliance tools, unlike TASER devices. But boy do they hurt! A good shock to the body will cause an immense level of pain. Sparking a stun gun in the air is great for warding off criminals and hostile animals alike. It's shockingly effective! The human brain relies on neurotransmitters and nerve cells to relay information throughout the body. These transmitters work much like a phone line, serving as a channel for communication. The jolt from the stun gun interferes with neural pathways, creating background "noise" that confuses the body. The result is loss of balance and depletion of energy. 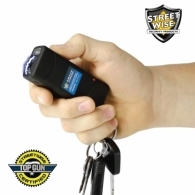 Stun guns use a combination of amperage (strength of the electricity) and voltage (the "pressure" behind the amperage) to affect a target. The amperage, or "current", is what packs the punch. IMPORTANT: remember that amperage, not voltage, matters when looking for a stun gun to purchase. 4.5 milliamp models tend to be the most effective. Stun guns used to be bulky and were operated by 9-volt batteries. The stun gun industry has evolved over time to include different variations. You can now find them in the form of a cell phone, baton, flashlight, tube of lipstick and even a walking cane! These "disguised" versions make it much easier to conceal and use against an unsuspecting attacker. It is extremely important for you to understand that stun guns are NOT like TASER devices; they are completely different self-defense tools. The stun gun is a direct contact device that causes pain while the TASER is an electronic control device (ECD) that shoots darts up to 15 feet away and hampers the electrical signals in the brain (neuromuscular incapacitation), causing the body to become temporarily disabled for as long as the trigger is held. There are a number of myths floating around out there that you need to be aware of before purchasing your first stun gun. We are committed to keeping you safe! Please go and check out our stun gun myths page in order to learn more. Omega and ZAP are two of the best stun gun manufacturers. Yellow Jacket is also good. Our budget option would be the ZAP Stun Gun . It is a standard hand-held unit that is easily concealable. Uses batteries and comes with a belt-loop holster for carry. 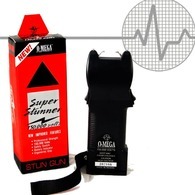 We recommend getting the Omega Super Stunner , Omega’s best stun gun. 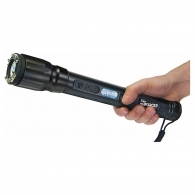 Our premium option is the Omega Star Warrior Stun Baton , which gives you more reach than a regular stun gun. Featured in a number of movies (e.g. Demolition Man), is in use worldwide by a number of militaries, law enforcement, security and animal control agencies. Uses two 9 volt batteries. TIP: For the greatest effect, always aim for the neck, torso, hips, groin and other sensitive areas or large muscle groups. 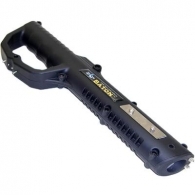 For more basic information on electroshock weapons, visit our stun gun & TASER FAQ page.